KTips in 140 characters or less | Who Says Penguins Can't Fly? Sometimes you have these ideas floating in the back of your head, and suddenly one day, BAM, they turn into something real. But before we get to the story, let me introduce you to KTips. 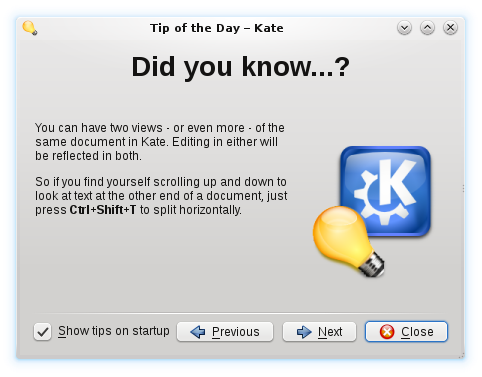 KTips is a new group on identi.ca for KDE users to share tips and tricks. If you join the group, you’ll see tips from the KDE community in your timeline. You can also share your own tips by adding !ktips to your messages. Now some of you might wonder, why another group instead of posting to the existing KDE group? The reason is simple: !kde has all kind of KDE-related topics, and some find it too noisy. If you only want those nifty tips, !ktips is for you. Members of both groups can always crosspost if they want. Personally I never read these dialogs for a simple reason – if I launch Kate, I want to start using Kate right away. Get out of my way. When I got my new Nokia phone, I could choose if I wanted to receive tips or not. I decided to give it a try and found their approach interesting – occasionally there would be an SMS from Nokia, each time containing a short tip. This way it doesn’t disturb me when I want to use the phone while still keeping me interested. Today I dented a tip to the KDE group when it hit me – why not make something similar for KDE? The 140 characters limit on identi.ca ensures that each tip is short and to the point, so the reader won’t be bored. You can read them in your web browser, on your desktop, in your microblog client – basically they won’t get in the way of your work. If you don’t like microblogs but still want to read the tips, you can add the RSS/Atom feed to your feed reader. Furthermore, you can contribute to it. And it’s extremely easy to do. This should also be a good place to look for content to add to Userbase. So what are you waiting for? Join today and receive lots of KDE tips – for FREE! Unfortunately it doesn’t seem possible at the moment. As mentioned, there’s the feed option although it doesn’t look as pretty.